It doesn’t have to be hosted in ASP.NET. It can also be hosted using OWIN (Open Web Interface for .NET) or self host (console, windows service, azure, etc.). Pushing data from the server to the client (not just browser clients) has always been a tough problem. 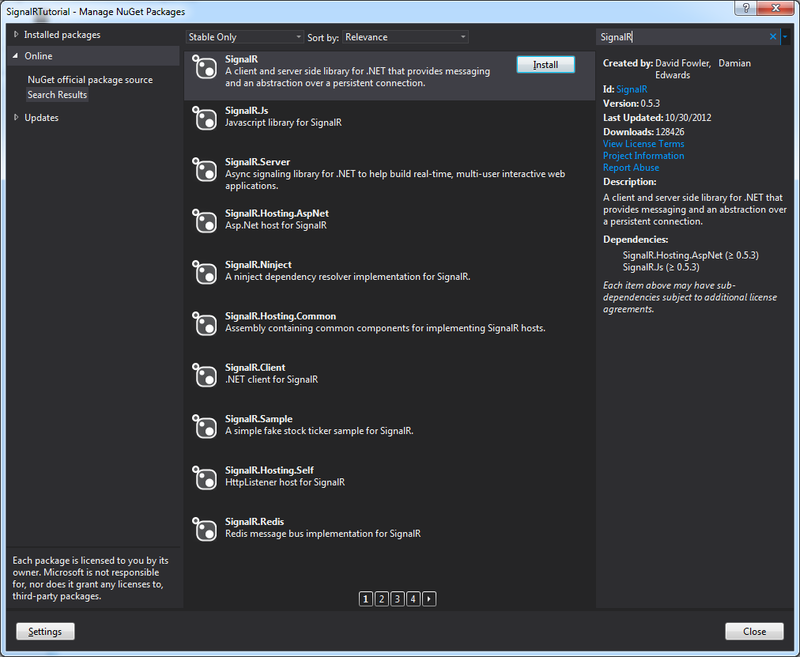 SignalR makes it dead easy and handles all the heavy lifting for you. SignalR abstracts the raw technique of keeping connections open between a client and a server. SignalR uses a fallback mechanism to connect the browser to the server. After an initial negotiation request the following transports are tried in order until a successful connection can be made: WebSockets, Server Sent Events (EventSource), Forever Frame, or Ajax long polling. There are two choices when developing with SignalR, PersistentConnections and Hubs. PersistentConnections - A PersistentConnection is the base class that has an api for exposing a SignalR service over http. Hubs - Hubs provide a higher level RPC framework over a PersistentConnection. If you have different types of messages that you want to send between server and client then hubs is recommended so you don’t have to do your own dispatching. For this article and tutorial, we will be focusing on Hubs. 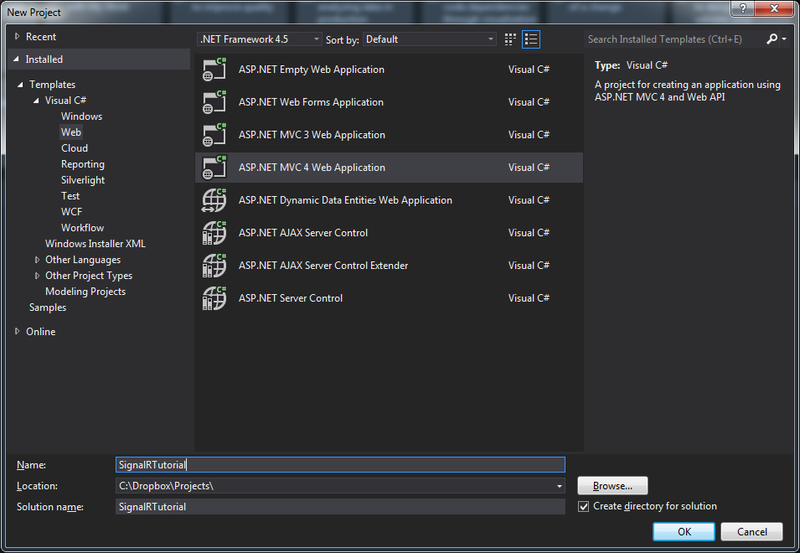 For this tutorial, we will be using Visual Studio 2012 with ASP.NET MVC 4. 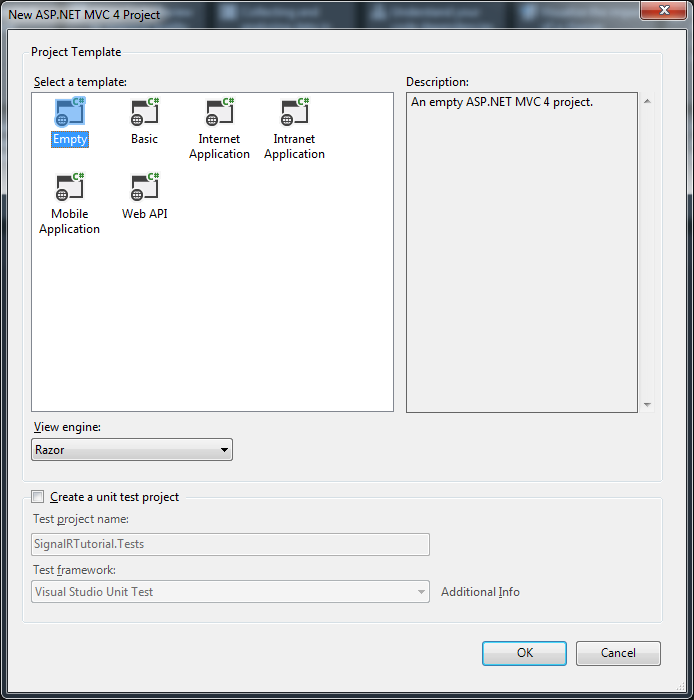 File -> New Project -> Web -> ASP.NET MVC 4 Web Application. Call your project anything you like. I used SignalRTutorial . Right click on the newly created project (in my case it is called SignalRTutorial) and click Manage NuGet Packages. Search online for SignalR and click install for the package named SignalR. It will automatically add all needed dependencies for you. 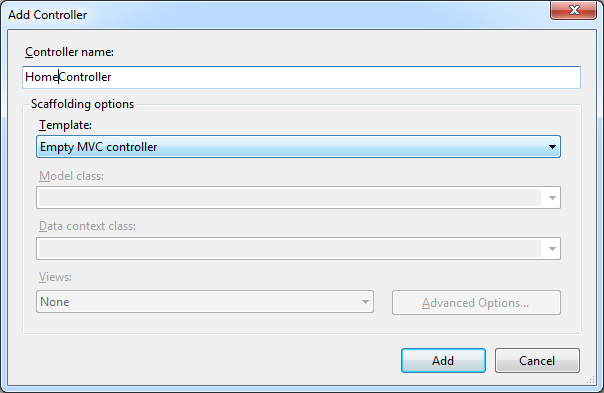 Right click on the folder labeled Controllers and select Add -> Controller. Name it HomeController and make sure the “Empty MVC controller” template is selected. In the newly created HomeController.cs class, right click the Index method and select “Add View”. Be sure to uncheck “Use a layout or master page” but leave everything else alone. Take a moment to make sure your project builds and run it using Ctrl-F5. You should see the web page open with nothing on the page. This is a good thing. 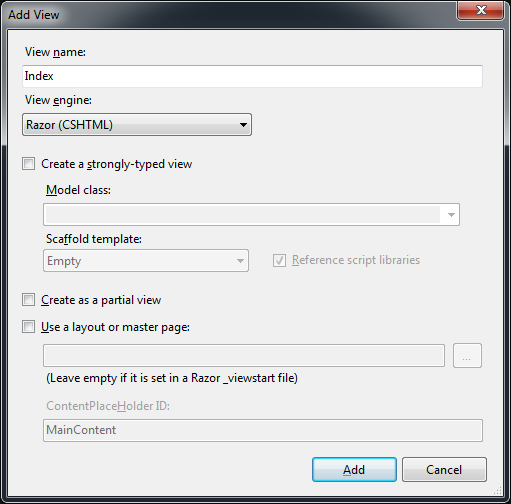 Create a folder in your MVC 4 project called Hubs. This is just for organization and clarity. You are not required to have your hubs inside a folder called Hubs. Create a class called TagHub inside the Hubs folder. Make sure to have your class inherit from SignalR.Hubs.Hub. This will allow SignalR to work its magic. Open Index.cshtml that was created earlier and modify it to the following code. We will now add support to our Tag web application to allow adding new tags. The one thing we want though is for all connected clients to have their list of tags updated when new ones are added. That is it for now! With very little code, effort, and complexity we were able to implement a collaborative web application.